How do I buy an Aire-Master of America Franchise? Are you ready to be your own boss? Aire-Master’s franchises are a tight community of hardworking people who genuinely appreciate the opportunities they experience as Aire-Master franchisees. This is due in part to our established national brand that boasts an almost 60-year history and an operating system that provides comprehensive training, on-going support, and an educational annual conference for all our franchisees. What goals do you want to achieve? See if an Aire-Master franchise will get you there. Simply complete the inquiry form today. There’s no obligation. Open Aire-Master of America in any of these available states: AL, AZ, AR, CO, CT, FL, GA, HI, IL, IN, IA, KS, KY, LA, ME, MD, MA, MI, MS, MO, NE, NH, NJ, NM, NY, OH, OK, OR, PA, SC, TN, TX, VT, VA, WV, WI, DC. Be Your Own Boss With Aire-Master! Aire-Master has been around since 1958. Starting out as a local commercial deodorizing service in Missouri, we began franchising our odor control and commercial hygiene business in the mid 1970s. Today we have over 100 franchises in the US and Canada. 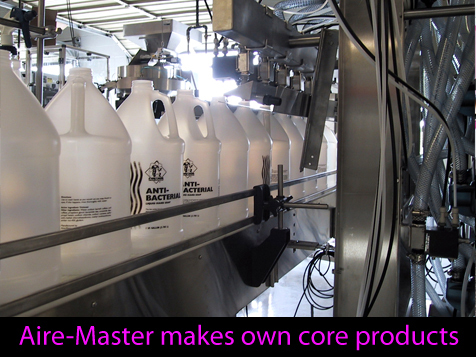 Aire-Master has become the market leader in the commercial hygiene industry. Has successful performance track record in business as an owner or employee. Has the ability to perform, hire, or supervise sales employees to make cold calls and preset appointment sales. Has the ability to hire sales people for sales of service and products business-to-business. Has the capital or borrowing ability to purchase franchise license and territory and build the business. Odor Control: We eliminate tough odors and leave facilities smelling great. Cleaning: We make restroom cleaning quick and easy for our customers by doing the hard work. Hand Care: We provide soaps and sanitizers for customers and employees. Fly Control: We make fly problems manageable safe and effectively. Aire-Master gives you a low initial investment opportunity. You can start your franchise by yourself, or with just a few employees. You can open a small office location, or run it right from your home. All you need is a small office space, minimal inventory, a computer, storage area and a suitable vehicle. multiple employees. The choice is yours. We value each and every person in our franchise system! We will do everything we can to make the franchising process as enjoyable and painless as possible. We’ll stay involved with you and extend our commitment to give you lots of encouragement and support. Aire-Master of America is not currently active in our directory, but here are some other recommended selections for you to explore.